NEW COMPLETE CLUTCH KIT & PULLEY COVER. JOHN DEERE 70, 720, 730 TRACTOR. (1) Clutch Drive Disc, (2) Slider Disc. (2) Clutch Pulley Disc, (2) Floating Disc, (1) Pulley Brake pad. (3) Clutch Springs, (3) Spring washers, (3) Castle / slotted nuts. (3) Clutch Dog pins, (3) Clutch Dog Toggles, (3) Clutch Dogs. (3) Operating T-bolts, (2) Clutch Linkage Pins, (1) Clutch Lever pivot bolt & bushing, (1) Pulley Cover. AA6129R, AD1027R, AD752R, RE22932, RE29779, A5642R, F1228R. C614R, R90215, AB4748R, RE29790, A352R, A4391R, A4355R, C434R. We carry NEW, QUALITY parts. Our parts fit the tractors and application as stated in the listing. We cannot be responsible for any alterations that may have been made to your tractor. For example: if someone has put a different engine in your tractor, changed the decals, or. Used an incorrect part prior to you ordering the correct part. We guarantee our parts, however, we cannot guarantee that purchasing this part will repair your specific problem. If youre un-sure of your mechanical skills, please have a qualified repair shop / mechanic perform the installation (repair) with this part. 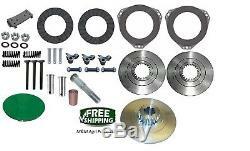 The item "Complete Clutch kit John Deere 70 720 730 Tractor Clutch Drive Disc Rebuild kit" is in sale since Thursday, January 11, 2018. This item is in the category "Business & Industrial\Heavy Equipment Parts & Accs\Antique & Vintage Equip Parts".